Last week, I began noticing small white bumps on my hands, arms, and face. This worried me, and I immediately went online to see if I could get to the bottom of the situation. I’m not prone to eczema, and I realized that my issues didn’t look much like eczema anyway. The closest thing I could find to my situation is keratosis pilaris. However, I’m not completely sure that’s what it is, since the Mayo Clinic says that most people get beyond it by the time they are 30, and I left 30 behind a few years ago. But, I can’t seem to find another explanation, and treating the situation like it is kerotosis pilaris has proved effective in getting the bumps to go away, so that’s the story I’m sticking to. Most bumps appear on upper arms, legs, cheeks, and buttocks. Mine also appear on my hands. Dry, rough skin in the areas containing the bumps. For the most part, keratosis pilaris goes away on its own, even though it can be inconvenient and annoying. If the condition persists, you might benefit from the help of a dermatologist. So far, I’ve been pretty good with the situation, and, once I got some tips on treating the condition, I’ve seen good results. But if you can’t seem to shake it, look into professional help. While you can use laser therapy to help treat your condition, I’ve had best results just using an exfoliant and then staying moisturized. There are also prescriptions that can help exfoliate your skin, but many of them contain different types of acid (hydroxy, lactic, salicylic, etc.). If you aren’t into those types of treatments, you might want to focus on some of the lifestyle things you can do. There are over the counter acne exfoliants that can help, but I’ve found that simple, natural exfoliants work fine. I have a facial exfoliant that I use. This type of exfoliant naturally removes dead skin, which is one of the reasons that you can end up keratosis pilaris. I discovered that one of the reasons you end up with the bumps is due to the skin not sloughing off the old skin cells. I also use an exfoliator on my body, and that seems to have helped reduce the bumps on my arms. You should also moisturize appropriately. Sometimes, when I’m rushing, I skip over the moisturizer. 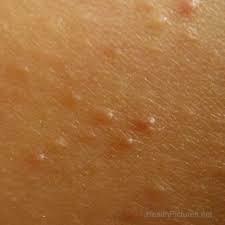 Unfortunately, this can lead to keratosis pilaris (as well as other skin conditions that result from dry skin). Since I’ve improved my use of moisturizer, especially on my hands, the situation has improved. I’m also changing my facial moisturizer. It seems as though my body’s changes in the last couple of years are resulting in oilier skin. Or my pores are enlarging or something. Anyway, I may need a different moisturizer for my face to maintain the balance and get rid of the more frequent breakouts (I get more acne now than I did as a teenager). Finally, reduce the hot water in your showers. Very hot water can dry skin out. Instead, use warm water to shower, and consider ending the shower with cool water to close the pores all over your body. Then, pat your skin dry rather than rubbing it with the towel. This will help your skin retain moisture. Do you have dry skin issues like keratosis pilaris during the winter? What do you do about it? You will receive all updates in your feed reader as soon as they are posted.